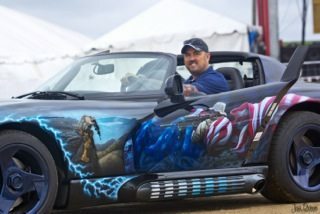 A custom restored 1993 Hennessey Viper Venom 500 turned tribute to Operation Red Wings (on which the book and movie “Lone Survivor” was based) will be auctioned at the 2016 Barrett-Jackson West Palm Beach classic car auction on Friday, April 8th at 3pm. 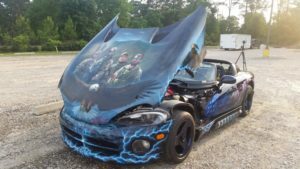 100% of the sale of this amazing vehicle will benefit Lone Survivor Foundation, a nonprofit founded by retired U.S. Navy SEAL Marcus Luttrell. Lone Survivor Foundation restores, empowers and renews hope for wounded service members and their families through health, wellness and therapeutic support. This awe-inspiring 1993 Hennessey Motorsports V-10 Viper was donated to the Foundation by Ronnie Rains, owner of Interstate Treating, Inc. in Odessa, TX. The restoration work and interior was done by Creative Auto Restoration in Odessa, TX. Renowned artist Mickey Harris from Menno, SD airbrushed scenes depicting the U.S. Navy SEAL team from Operation Red Wings: Lt. Michael P. Murphy (KIA), Petty Officer Matthew Axelson (KIA), Petty Officer Second Class Danny Dietz (KIA), and Petty Officer Marcus Luttrell (Ret.). The SEAL team was ambushed on June 28, 2005 while on a mission to gather intelligence on Taliban leadership in Afghanistan and Luttrell was the only survivor. The Lone Survivor Foundation restores, empowers, and renews hope for our wounded service members and their families. The Lone Survivor Foundation provides support for our wounded service members, veterans, and their spouses and children by empowering them with helpful techniques and tools addressing Post Traumatic Stress Disorder (PTSD), mild Traumatic Brain Injury (mTBI), Military Sexual Trauma (MST), and pain management. The Lone Survivor Foundation is a Federal 501(c)3 non-profit. To learn more visit www.lonesurvivorfoundation.org.